PR Info _ Wowhaus concentrates primarily on the design of public space and planning cultural buildings. The most important aspect of their work is to create spaces where social life develops and new activities can be pursued. This intention is particularly notable because until recently most of Moscow’s public spaces were either huge and empty or entirely filled with parked cars. 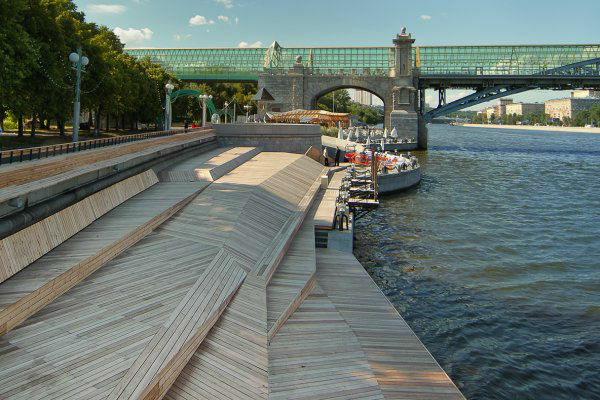 Ever since the world-famous Gorky Park was redesigned (Wowhaus, 2010), a general change in mind-set has taken place: Numerous public spaces were redesigned, financed by public and private commissions. The projects by Wowhaus are amongst the most important of these projects and represent the re-thinking of urban spaces. To demonstrate the idea of Architecture for communication Moscow based Pioner Cinema curated a series of venues. Under the motto „From Soviet Avant-garde to New Documentary“ it is going to screen outstanding movies every Wednesday and Thursday night for a duration of four weeks. Complete program is available on www.architekturgalerieberlin. de.